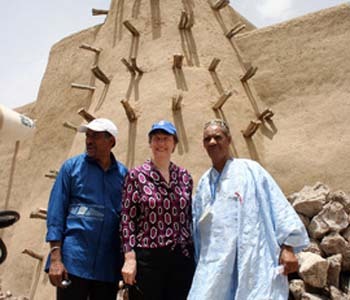 Timbuktu conjures up images of remote parts of the earth and fabled ancient monuments. Now radical Islamic groups, with ties to al Qaeda, have taken over the north in Mali, destroying monuments and torturing civilians in a brutal interpretation of Sharia law. France, the former colonial power of Mali, in west Africa on the edge of the Sahara, and other nations are worried but not worried enough to send in troops, saying it is in the interest of African nations to rescue the area. Western nations will help with humanitarian and military aid if such an intervention takes place. "What is happening inside Mali is augmented by the rising threat from violent extremism across the region," Secretary of State Hillary Clinton told a meeting that included France's President François Hollande on the sidelines of the U.N. General Assembly session. For some time, al-Qaeda in the Islamic Maghreb (AQIM) and other groups have launched attacks and kidnappings from northern Mali into neighboring countries. Now, with a larger safe haven and increased freedom to maneuver, terrorists are seeking to extend their reach and their networks in multiple directions. Some 440,000 people have been forced from their homes and over half of them have fled across the border into neighboring Niger, Mauritania and Burkina Faso. The conflict is exacerbating a food and nutrition crisis which is affecting 30 percent of the Malian population of 15.8 million. Some 175, 000 children are at risk of severe malnutrition, according to the U.N. humanitarian affairs office (OCHA). Women have been subjected to curfews, and have been publicly whipped for failing to wear veils. It's also forbidden for them to be in the streets with men who aren't their husbands or relatives. Hands have been sliced off of accused thieves and children have been inducted into militia. In July, Islamists in northern Mali stoned a couple to death after accusing them of having children outside of marriage, a local official who was one of several hundred witnesses to the killings told news media. "I was there. The Islamists took the unmarried couple to the centre of Aguelhok. The couple was placed in two holes and the Islamists stoned them to death," a local government official told the AFP news agency on condition of anonymity. The U.N. Assistant Secretary-General for Human Rights, Ivan Šimonović, said that abuses in the north included three executions, eight amputations and two floggings in recent months. Forced marriages were common, he said after a recent visit. One person interviewed had told him that "women were not only for sale, but also 'on sale' in the North, and can be bought for less than $1,000." U.N. Security Council asked to back force; Algeria says "no"
ECOWAS, the Economic Community of West Africa, is organizing a force to help liberate the north and has asked for backing from the U.N. Security Council. But Algeria, which has the largest military in the region and has chased radicals out of its country, has decided not to contribute troops. The Security Council, which has been musing over the issue for months, will adopt two resolutions. The first, said France's U.N. ambassador, Gérard Araud, was expected to be passed shortly and would call for negotiations with groups in the north. It would ask "armed groups to disassociate themselves from terrorism and negotiate with the Bamako government," Araud told reporters. "We won't have a sustainable solution without a political process." The second resolution would authorize military force after an October 19 meeting in Bamako among the African Union, ECOWAS and the United Nations, which will be represented by the former Italian prime minister, Romano Prodi. Council members first want to see the "concept of operations," Araud said. "We are not going to give a carte blanche as we need to have concrete elements." Present-day Mali was once part of three West African empires that controlled trans-Saharan trade. During its golden age from the 14th to the 16th century there was a flourishing of mathematics, astronomy, literature, and art. Its economy deteriorated steadily due to drought and locusts. In the late 19th century France seized the area. It became independent in 1960 and established one-party rule until 1991 when a coup led to a new constitution and a democratic, multi-party state. In fact, Mali was considered so stable that it was open to the establishment of U.N. Millennium Villages. One such village near Diori, in southern Mali, is financed by Renzo Rosso of Diesel (jeans). The villages seek to lift communities out of poverty by boosting agriculture and building schools and health clinics, among other services. In January, secular Tuareg Mali rebels, complaining of neglect by the central government, had taken over parts of the north, backed by fighters who had fought in the army of ousted Libyan leader Muamar Gadaffi. Islamist groups with links to Al-Qaeda took over northern Mali in March, an area larger than France, following a coup by junior officers against the government in the capital Bamako. Now Timbuktu itself is under the control of Ansar Dine, a radical Islamic group, which has ties to Al Qaeda in the Islamic Maghreb (AQIM). Currently an interim government is in place with plans to hold long-delayed elections, which are fairly impossible with more than half of its territory under control of Islamic militants. Hostages have been taken from several Western nations. How they are captured was described by Robert Fowler, a former U.N. ambassador from Canada. He and a U.N. colleague were traveling through a remote stretch of southwestern Niger, near the Mali border, when gunmen forced them from the road in 2008. "We were thrown into the back of a truck, driven back the way we had come, our wrists were bound and we began what I call our 56-hour descent into hell," Fowler told National Public Radio. He remained in captivity for 130 days, a prisoner of Mokhtar Belmokhtar, an Algerian who is a top al-Qaida figure in the region and has been linked to violence throughout north Africa. "This is the first time that Al Qaeda really has a country, a more or less secure base from which to operate," he says of Mali and surrounding areas. "Certainly I would argue that allowing them to maintain that secure base represents a significant threat to Western interests, most immediately to European interests, but very soon after that, North American interests. This is the most focused group of individuals I have ever met." Šimonović, the human rights official, said the south was not free of abuse and torture. "There is a need to address these root causes, including wide-spread corruption, mismanagement of public funds, inequality between the elite and general population and nepotism, amongst others," he said. The International Crisis Group, which has done extensive research on the Sahel, the region on the edge of the Sahara spanning several countries, says concerted political and diplomatic effort is needed on intercommunal tensions within Malian society. But it warns that without Algerian participation. a military venture would have severe problems. "The Malian army and ECOWAS's forces will not be capable of tackling the influx of arms and combatants between a fragmented Libya and northern Mali through southern Algeria and/or northern Niger. Minimal and sustainable security in northern Mali cannot be reestablished without the clear involvement of the Algerian political and military authorities."